The first night at Wembley kicked off with a surge of energy and maintained that momentum throughout a memorable evening that has been well captured on unofficial recordings. Since I was attending all five UK concerts and was pretty familiar with the set list and arrangements by tonight, I decided to focus on the different pairs of musicians across the nearly three hours of the show. The contrast between Bill Bruford and Alan White in the percussion department particularly stood out, not least in the drum duet that opened the second half of the set. White provided the kick behind an 11/8 pulse, while Bruford skittered across his top kit and triggered Simmons chordal effects. Likewise, Tony Kaye provided texture and shards of sound from his tight keyboard rig, while Rick Wakeman milked a larger keys set up and leaned heavily towards runs and flourishes, such as the baroque and roll coda to �Owner of a Lonely Heart�. As for Steve Howe and Trevor Rabin, the difference was best illustrated in their contrasting solos on �Yours is No Disgrace�, where Howe opted for his traditional clean-cut, more exposed and jazzy feel, but Rabin�s sound was fast, emotive and cleverly processed. All told, the individual components of this eight-piece played quite differently, but the three pairs still managed to solidify into a single high impact unit, gelled by Jon Anderson�s soaring vocals and Chris Squire�s pugnacious bass. It looked cumbersome but sounded pretty good. I find Tim Jones' reported setlist rather unlikely. But for now, I've put it up. Perhaps someone who has heard one of the two audience recordings can verify. "Take The Water To The Mountain", "Soon", and "Saving My Heart" were also in the setlist. According to Tim Jones' essay in THE WORD IS LIVE, Yes played "Starship Trooper" after "Roundabout" and the encores were "Gimme Some Lovin' and "Close To The Edge". The heady "Yours Is No Disgrace" counterpointed the razor-sharp thrust of "Rhythm of Love", while the punchy "Shock To The System" was followed by "Heart of the Sunrise", taking us soaring to another plane. Each song was met with delight, and the kind of welcome previously reserved only for a returning prodigal son greeted Steve's acoustic spot, featuring evergreen favourites such as "Clap" and "Mood For A Day". These fine airs were juxtaposed with a nod to the more recent past, as "Owner Of A Lonely Heart" was delivered in scintalling fassion, elliciting equally heavy acclaim. The heavenly "And You And I" delivered a measure of stillness amid the storm, but this was a mere pause. For a percussion roust par excellence erupted, featuring full-steam ahead galleon rhythms from Alan and a bewildering, syncopated maelstrom care of Bill. After the catchy AOR of "Hold On," Trevor's own phenomenal soloing was spotlighted on Solly's Beard," which caused even dyed-in-the-wool Howe acolytes to acknowledge his stunning craft. The way was thus cleared for a catch-your-breath "Take The Water To The Mountain" and pleading "Soon," which made for a plateau of restful calm before we were geeked up again by the all-guns-blazing assault of a monumental "Long Distance Runaround" and rollicking "Saving My Heart". Next, Chris proved that bass solos don't have to be a cue to go for beer. Following the invigorating "Lift Me Up," and Jon's intimation that the evening's proceedings were being recorded (release! release! ), Rick took centre stage from his position stage right (if that's possible) His usual astounding display of ivory-tinkling, coursing through pieces from "Six Wives," had us all chortling like children on Christmas morn. With a euphoric "Awaken" dizzying our senses further, we were then staggered by the one-two jab and uppercut of an ebullient "Roundabout" and colossal "Starship Trooper". As the band filtered off to a tidal wave of adulation, my brother and I beamed from ear to ear, looking like we'd just escaped from a secure unit. Then we spotted a chink in the black drapes surrounding the stage and saw the band, crouched beneath it, equally chuffed, giggling and congratulating each other. On their hallow return we were further dazzled by an unexpected "Gimme Some Lovin'" and struck with a TKO in the shape of a tour de force "Close To The Edge". It struck me as very odd indeed that the band almost completely ignore the Union album whilst undertaking a tour based on its name. This was in the pre-internet days, when any news of the band was scarce. I had little idea then why this was the case! I thought the shows were tremendous. A fantastic stage set with this weird spider's legs lighting truss that went up and down, especially during Awaken, which was the highlight of the show. There was a half time interval, and much of the audience were still outside the arena when Alan and Bill returned to the stage for their duet. The setlist was a delight, despite the lack of Union material (much of which I really liked at the time)and the band were on top form. I was a bit miffed that most of them got a solo, except Chris. Rabin's Solly's Beard was excellent, Tony Kaye's bit was hopeless. This was their last big global arena style tour. Three nights at Wembley would be unthinkable for the band right now, but I'd love to see them fill it up again! 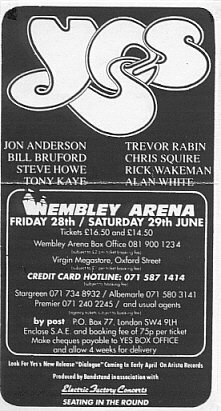 At the Wembley show for the Union tour Big Steve did play [on Owner Of A Lonely Heart], but only an acoustic guitar and from where I was sitting I don't think he was enjoying the experience.